Abstract - This technical paper was prompted by the interactions at the 2009 Accredited Tier Designer sessions and industry comments and queries. 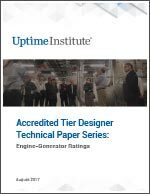 It provides additional detail regarding the Tier consequences of engine generators and their ratings. The core premise, as set forth in the Tier Standard: Topology, is that the only reliable source of power for a data center is the engine-generator plant. Only continuous ratings, derated prime ratings or standby ratings with no runtime limitations qualify for the Tier III or IV requirement for engine generators.